Editors' Picks: Our Favorite Hunting Spot in Every State! People have been hunting, pretty much ever since the first caveman discovered that a slice of stegosaurus on the fire was delicious. Hunting for food remains a tradition among many cultures and countries, including America; trophy hunting is something else. The concept of killing a large animal mainly for the purpose of displaying it became a "thing" in America during the second half of the 19th century. As more people moved into cities, men tried to recapture their macho past by hunting the copious amounts of big game that still populated parts of the country. Enter future president Teddy Roosevelt. A hunter himself, he was alarmed at the wholesale slaughter of animals that he was witnessing. In 1887, he helped form the Boone and Crockett Club, to help track and limit the hunting of animals, and put some conservation measures in place. In 1906, he unveiled the scoring system still used to this day in hunting big game. These days, there are about 17 million hunters in the U.S. Deer hunting is most popular, with turkey and squirrel coming in second and third, respectively. While there are roughly 700,000,000 acres open for hunting in America, here are some great places in each state. The Black Warrior area within the William B. Bankhead National Forest attracts hunters looking to nab a big buck. Deer aren't necessarily plentiful, but the ones that pass through are impressive. There are all kinds of wildlife in this rugged state; the area near Haines is home to some of the biggest mountain goats in America, and possibly, the world. Some come close to 400 pounds. The hunting areas around Mesa offer a variety of targets. You'll find healthy numbers of rabbit, quail and dove - or trade up to something larger. Black bear are plentiful. Buck Island is a favorite spot. Over the 1,510 acres, sportsmen hunt for deer, rabbit and quail. Knoxville State Wildlife Area (located near Napa) has over 8,000 acres. Serious hunters hike-in (no vehicles are allowed) to take a shot at the copious amounts of deer. Hunters in the Grand Junction area go for elk; there are tons of them. The scenery is pretty incredible, too. Waterfowl and game birds make their home in Tunxis State Forest. Hunters can also find moose and black bear. The Prime Hook National Wildlife Refuge is a controlled marshland habitat. So naturally, you'll find lots of wood ducks, black ducks and other small game. Roberts Ranch is located in Palatka, and offers a pretty cool guided hunting tour. You'll encounter turkey, wild hogs and deer. The Lake Russell Wildlife Management Area, near Toccoa, is a popular spot. There's a huge variety of wildlife, from squirrels and rabbits, to wild hogs, deer and bears. The Palawi Basin, on Lanai, is 6,000 acres that once served as a pineapple plantation. These days, it's a popular spot for deer-hunting; local experts claim hunters have a 98% chance of success. The Salmon River is the place to go if you're on the hunt for mountain lion, trophy elk or bear. Those interested in birds can bag spruce grouse. The Shawnee National Forest provides ample opportunity to hunt whitetail deer. You'll also find waterfowl, turkeys and various small game. The northwest corner of the state is home to the Kingsbury Fish and Wildlife Area. Some parts are off-limits to hunters, but that's just helped the deer population thrive, making it a favored destination for deer hunting. Those in search of an epic buck can find one pretty much anywhere in the state. But the Red Rock Public Hunting Area is known as home of some of the biggest. Despite its reputation as "flat," the state has diverse topography that offers interesting wildlife. The Smoky Hills feature pheasant, quail, doves and waterfowl. Bow hunters go for giant bucks, too. The western part of Kentucky is home to geese, quail, dove, turkey and waterfowl. It also has one of the biggest concentrations of trophy deer anywhere in the country. The Atchafalaya River Basin, located in the southern part of the state, is the largest backwater swamp in the country. So that makes it a bonanza for waterfowl hunters. The area around the town of Vassalboro is known for a huge turkey and deer population. In fact, Vassalboro is considered the top hunting town in the state. The Eastern Shore is smack in the middle of the Atlantic Flyway, making it a rich place for waterfowl hunting. Duck and goose hunting is baked into the culture of this area. The Crane Pond Wildlife Management Area has plenty of opportunities for small game. Rabbit is plentiful. 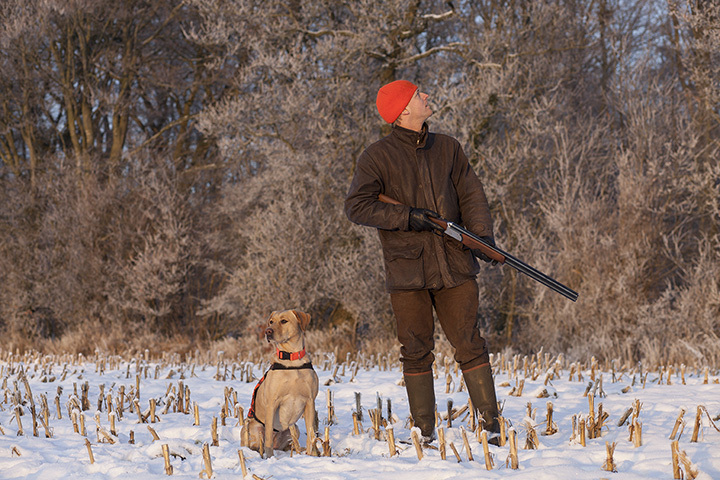 Bird hunters can go for pheasant, which are stocked annually. The wild turkey population in the state is massive; roughly 30,000 birds are taken each hunting season. Gladwin County is a prime destination. It may be known as the "land of 10,000 lakes," but the southeastern part of the state is developing a reputation for giant trophy bucks. If that's not your thing, the state is known as one of the best for grouse. The 60,000 acres of bottomland around Sunflower is a favorite for small game hunting. Squirrel and rabbit are plentiful; you'll also find deer. The Woodson K. Woods Memorial Conservation Area, in the central part of the state, is a favorite for deer hunting. But there's a catch: no guns are allowed, archery only. There are two national forests that regularly attract serious hunters. The Kootenai and Lolo are home to whitetail, turkeys, ruffled grouse and elk. There's a tiny town by the name of "Arnold" in the north-central part of the state. With a population of 500, the joke is that there are actually more deer (whitetail and mule) in the area than people. Mule deer are the big prize in the Silver State, but the population has been struggling in recent years. For that reason, there are all kinds of restrictions on their hunting. Elko County is known as a good area. The forests in and around the White Mountains are heavy with plenty of wild birds, like turkey and grouse. But check with the local authorities, as the area butts up against some privately owned land. The state famous for its turnpike is also home to everything from coyote and fox, to wild turkey and duck. Monmouth County is a favorite for deer hunters, with one of the best populations of the animal on the entire East Coast. The Valles Caldera National Preserve, outside Los Alamos, is home to super-sized elk. To get in on the hunt, though, you must be chosen from their lottery program. Lake Placid, in the Adirondacks, is right next to about a quarter-million acres of state forest. Hunters go for black bear and whitetail deer. The Uwharrie National Forest in the central part of the state is a traditional place for deer hunting. Some of the largest bucks have been harvested here. The state offers a variety of game to hunt. If you're looking for moose, the Turtle Mountains (in the eastern part of the state) are where they hang out. Coshocton County, which features 50,000 acres of public hunting grounds, is the largest in Ohio. It's frequently ranked in the state's top 3 places for bagging a buck. The Three Rivers Wildlife Management Area near Broken Bow is over 200,000 acres. Hunters will find everything from whitetail deer to raccoon, squirrel and wild turkey. The hunting area along the John Day River is home to some serious trophy-sized big horn sheep. Although its done by lottery, locals remark that the chance of drawing a permit are pretty good. Most of he Moshannon State Forest in northern Pennsylvania is open to hunting (although a few spots near more populated areas are off limits). You'll find turkey, grouse, deer and black bear. The Arcadia Wildlife Management Area is known as one of the best places in the state to hunt cottontail rabbit and snowshoe hares. You'll also find huge amounts of fox, raccoon, pheasant and wild turkey. Within the quarter-million acres of the Francis Marion National Forest, you'll have plenty of chances at small game like squirrel, plus whitetail deer, quail and turkey. There are tons of great hunting areas around Rapid City - and a huge variety of game. From coyotes, prairie dogs, pheasants to mule deer and elk, hunters will never be bored. The Yanahli Wildlife Management Area is central TN is a favorite of deer hunters. Those "in the know" hit the Duck River by boat to bag the giant bucks that retreat there. Uvalde, in the southern portion of the state, is known as the best area for dove hunting, pretty much anywhere in the entire country. Hunters also go for deer. The Ashley National Forest is where a world-record elk was taken a few years back. Utah is known as one of the best states for elk, and this public land hunting area is a prime site. The Nulhegan Basin Division is pretty remote - which makes it an all the better home for a variety of wildlife. You can go for moose, ruffled grouse and snowshoe hare. Virginia is recognized as one of the great states for deer hunting, with many record-breakers taken over the years. Bedford County ranks as a top destination for nabbing trophy bucks. The Palouse Region in the state's southeast corner is home to thriving herds of mule deer. Hunters can typically expect to see over 200 on any given autumn day. The 60-mile Charleston-Beckley Corridor is home to more black bears per square mile than anywhere else in the state. An average of 2,400 are taken each year. The Badger State is considered the best state for trophy deer. The hunting areas around Appleton are prime locations for nabbing some record-breaking bucks. Those in search of mountain wildlife must head to the backcountry areas outside of Cody. Pronghorns, mule deer, bighorn sheep and elk are plentiful.